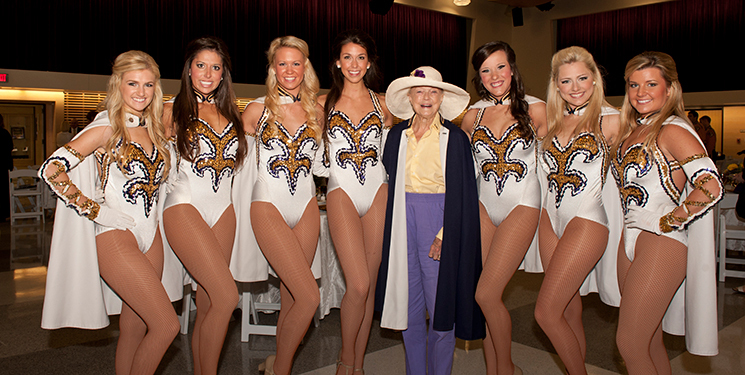 Sue Turner stands with LSU’s Golden Girls at the 2012 Tiger Band Hall dedication. Sue W. Turner’s dedication to LSU is more than 65 years strong. Having both earned their bachelor’s degrees from the university in the 1940s, she and her late husband, Bert, never wavered in supporting their alma mater. Now the matriarch of Turner Industries, the industrial service company Bert founded more than 50 years ago, Sue has devoted her life to bettering LSU and Baton Rouge as a philanthropist and community activist. Notably, she is a strong supporter of faculty, historic preservation and the arts. Within the community, she worked tirelessly to save BREC’s Magnolia Mound Plantation from demolition, and has served on several boards, including the Louisiana State Museum, BREC Foundation and Friends of Magnolia Mound Plantation. On campus, she has served on the boards of the LSU Foundation, Burden Foundation and the LSU Rural Life Museum, as well as serving on the Forever LSU Art Museum Campaign Committee. Sue is an LSU Foundation Laureate Society member, designated as a Troy H. Middleton Laureate in recognition of her lifetime giving. Her generosity spans two campuses and more than 30 units. She has supported faculty through a chair and more than 10 professorships. In addition to her role on the LSU Foundation Board of Directors, Sue serves the university as a member of the College of Art + Design’s Dean’s Circle and the Society for Engineering Excellence. She has also received the President’s Award, Louisiana Association of Museums Award and Golden Deeds Award, and was recognized as a Tiger Leader in the LSU 100. She was a trustee for the National Trust for Historical Preservation, and was a founding member of both the Louisiana Association of Museums and, with Bert, the Pennington Council of 100.